The emergence of pre-painted steels in the last 100 years has meant a wide range of application specific improvements to material selection across many industries. Commercial quality products can be divided into 6 main categories and can be distinguished by the manufacturing techniques and subsequent properties. PVC, organic coated sheets, coils, color coated products, more popularly known as “pre-painted products”, have shown a phenomenal growth in the past decade in various Industrial and decorative applications worldwide. The application of coating by use of rollers is believed to date back around 100 years. Cold rolled steel in coil stock form was roller coated as early as 1927 but the modern coating lines were built during 1930s. The mass production of products dates back to 1962 and was first developed in the US in the early thirties by the Venetian Blind Industry, which created an urgent need for developing a fast, reliable and efficient method with uniform application of paint to narrow strip widths at relatively high speed. Color coating/PVC/Organic coating has rapidly emerged as one of the most modern and advanced techniques for the production of uniformly high quality decorative materials comprising of metal feedstock and organic coatings at relatively low cost. This composite in coil form can be manufactured to a very wide range of user specifications and can subsequently be tailored to an almost infinite variety of end uses. 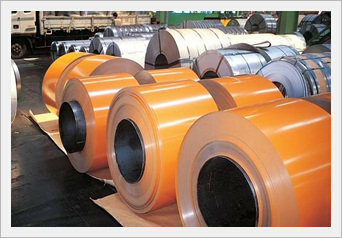 Continually growing need for saving space, material, time, energy, cost and improving corrosion protection to reduce the life cycle costs of industrial equipment and consumer goods has been responsible for the coil coating industry to grow at an unprecedented rate and witness developments during the last twenty years in the field of machinery and equipment, substrate, primers and to coats. In recent years, the demand for pre-coated sheets has been rapidly increasing as a result of benefits in comparison with previous methods of post-coating, specifically in terms of costs, reduced environmental pollution and higher productivity. The make-up of the paint-film layers applied to the products is, in sequence from the underside: backing coat, chemical treatment, steel sheet, chemical treatment, primer coat and top coat. Different film layers can be painted on both surfaces of steel sheets. 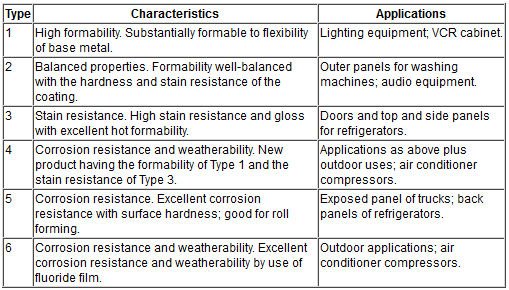 Commercial-quality products are divided into six categories depending on the degree of formability required, as shown in Table 1. Type 1 has excellent formability and is used for fluorescent lighting fixtures and VCR cabinets; Type 2 also has excellent formability which is balanced with hardness and stain resistance; and Type 3 has high stain resistance with excellent hot formability. Type 4 combines the formability of Type 1 and the stain resistance of Type 3. Type 4 products are used for the outer panels of washing machines and for outdoor applications such as air conditioner compressors. Deep drawability pre-painted sheets are used for certain parts of automobiles, such as the oil filter case and petrol tank – the coating film has the capability of stretching with the base metal by up to 200%. This entry was posted in Coated Steel. Bookmark the permalink.